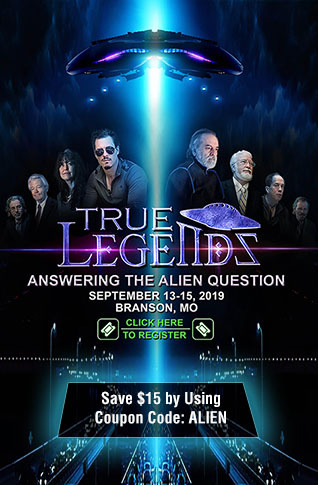 The New World Order Will Rise Out Of The Nuclear Ashes Of The Old World Order: Has The 'Head Luciferian' Given The Go Signal? If others have noticed the sudden onslaught of many different tumultuous global events seemingly breaking out at almost the exact same time and all across the planet, you're not the only ones. Between illegal immigrants rushing the border here in America and President Trump threatening to completely shut down the border to what appears to be a civil war breaking out in France, to the Ukraine and Russian hostilities threatening to have tragic consequences to the UK taking a very authoritarian 'brexit' from the EU, one which the EU dictated most of the terms, the 'simmering' that we've long been witnessing is headed towards a total boil over. And while all of these events might seem unrelated to some, they're all much easier to understand and decipher as being part of a package when we understand the 'global nature' of 'globalism' and the 'globalists', where people like Hillary Clinton, George Soros and Barack Obama to name just a few are able to play all sides and have clearly put 'globalism' ahead of 'America'. And while the situation between Russia and the Ukraine is happening thousands of miles away from America, that region has suddenly become the world's most dangerous powder keg as a regional war there between Russia and the Ukraine could quickly turn global. 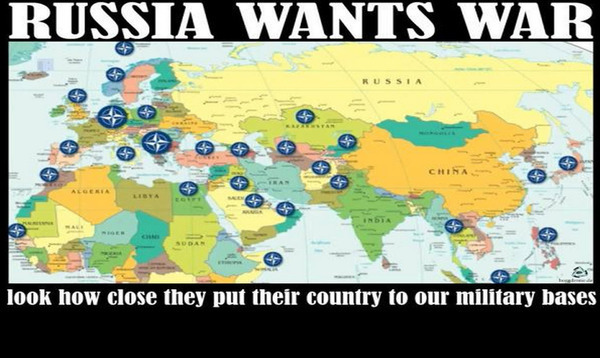 Should NATO and/or the US jump in to defend the Ukraine and directly attack Russia, tens of millions of Americans and billions across the planet might only have 20 to 30 minutes to prepare for nuclear war should Russia follow through upon its promises to attack those who attack them. And when they've warned they'd 'attack', they've clarified by warning they'd obliterate us. As Politico reported back on June 11th, Americans are completely unprepared for a nuclear attack upon our nation. While Russia has built nuclear fallout shelters for a large percentage of the population of Moscow, Poltico reports the US government hasn't made it easy for Americans to know what to do if nukes start raining down upon America. In fact, most of the bomb shelters here in America were built for the Washington DC elite. What would you do if suddenly you got that 20 to 30 minute warning? Warning within their story that "the U.S. population would theoretically have a 20- to 30-minute warning before the multi-megaton bombs began bursting in air, spreading radioactive fallout in overlapping lethal circles and the lights started going out—for good", life as we know it instantly comes to an end in such a situation. And with the president of the Ukraine declaring martial law while the United Nations Security Council has an emergency meeting to discuss these latest events, the world may be closer to WW3 than at any time in years. A respected foreign journalist living in Ukraine is warning that a war that most Americans cannot even imagine “teeters on the razor-thin edge of becoming real”. When Russia opened fire on Ukrainian Navy vessels and captured three of their ships, it made headlines all over the globe. An emergency meeting of the UN Security Council was hastily arranged for Monday at 11 AM, and hopefully, there will be a positive outcome from that meeting. Because right now Moscow and Kiev are on the brink of war, and once a Russian invasion happens there will be no turning back. At that point the U.S. would have a major decision to make, and if we chose to defend Ukraine that could mean that we would suddenly find ourselves fighting World War 3. 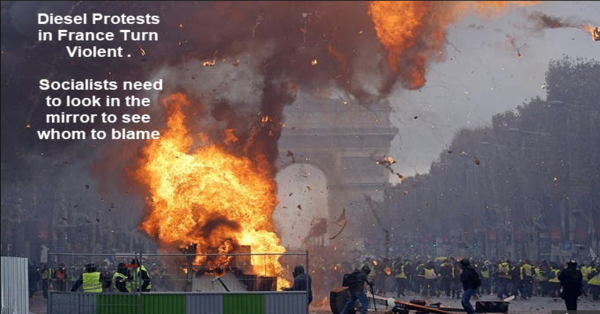 And look at what's happening now in Europe, specifically France, where protesters against rising fuel taxes have led to the streets of Paris on fire with some warning of civil war. While France's president Macron has slammed the protesters and their violent tactics, police there have struggled to maintain order and as this new story over at The Guardian reports, a huge reason behind the protests is that the people of France are becoming more and more in debt and many can't even afford to eat. When we remember what has long been reported within the independent media about how dangerous hungry people can become, it's easy to understand how the situation in France may completely spin out of the control of authorities there and a widespread civil war or revolution actually take down Macron in the future. And while Britains demanded and voted for 'change' with #Brexit, we're not the least bit surprised that the globalists are making that as difficult as possible as they see their own control slipping away. In fact, with the head of the UK Army recently claiming Russia is of more danger to the UK than ISIS, Britainers should remember that a Russian nuclear strike upon their country would only take 20 minutes to reach its destination, "20 minutes to extinction", so why continue to poke the Russian bear? And we see in this new story over at the Organic Prepper that the nation of Sweden is taking another step in a totalitarian direction with Sweden rapidly turning into a cashless society. Giving the Swedish government 'digital control' over every single person in the country, as their story asks, "what could possibly go wrong?" And we also see that Justin Trudeau and Canada are making a faustian deal with the devil as the Gatestone Institute reports within this new story by allowing their nation to become nearly a completely borderless country. And within their story we see why globalists rarely criticize other globalists and practically never criticize unlimited immigration. And now we see much of the same that happened to Europe happening here in America with illegal aliens storming the border and playing perfectly into the hands of George Soros and the Democrats who need the votes of illegal aliens to win the presidency back in 2020. With the msm once again turning to their 'it's for the children' angle we'd love to ask them, what about all of the homeless children in America, which number an absolutely heart breaking and staggering 2.5 million a year? As Steve Quayle had mentioned while linking to this recent story over at Breitbart, "Sympathy for the devil. Create humanitarian crisis and voila, the UN comes to the rescue, forcing these warriors into the USA!" The conclusion to Steve's note cannot be overemphasized: "This is the fight for the future of our country!" 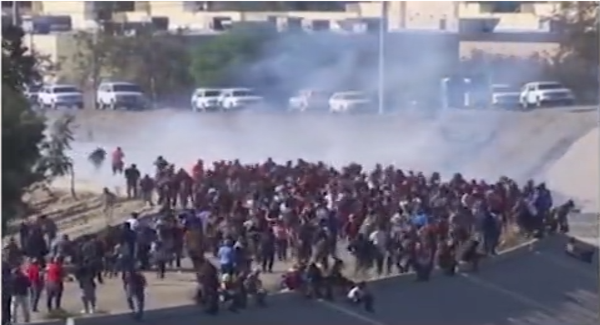 And while the mainstream media will always highlight a child or two at the border, as Pamela Geller reported in this new story over at the Geller Report, a recent video of these 'invaders' taken in Tijuana at a food line showed only young men of military fighting age, with not a child in sight. Remember that back in October of 2016 during a presidential debate, then candidate Donald Trump warned of Syrian refugees potentially being a great trojan horse. Are we witnessing one again just south of the border? And though we do not have absolute proof that all of these global events are coordinated as a last gasp globalist effort to regain their quickly waning power, with the globalists able to 'pull strings' all across the planet, we wouldn't put it past them with the Kerch Strait incident looking more and more like an intentional provocation by the Ukrainian government to gain Western sympathy and score political points ahead of their 2019 election. Other hotspots to watch out for over the following days, weeks and months include escalating tensions between the US and China in the South China Sea as well as the possibility of tensions heating up between nuclear-armed India and Pakistan, each should they heat up simultaneously being more signs of an outbreak of global war. And as Steve Quayle recently warned us, should suddenly we hear of Vladimir Putin evacuating the citizens of Moscow to the bunkers, it's 'game on' and Americans should know that time is very, very short. It's long been warned that the globalists will have to take down America before completely establishing their 'new world order'. And like the phoenix rising from the ashes, their 'new world order' will be built out of the ashes of the 'old world order'. Will they be 'nuclear ashes'? Has the 'head globalist luciferian' given the 'go signal' to bring this 'old order' crashing down? Certainly a large part of the 'crash and burn' will include a new global financial system and as Catherine Austin Fitts recently warned USA Watchdog's Greg Hunter, "we are living with maximum uncertainty" and "clearly, we are headed into a new currency world that’s part of a new control system, but the answer is we don’t know when." 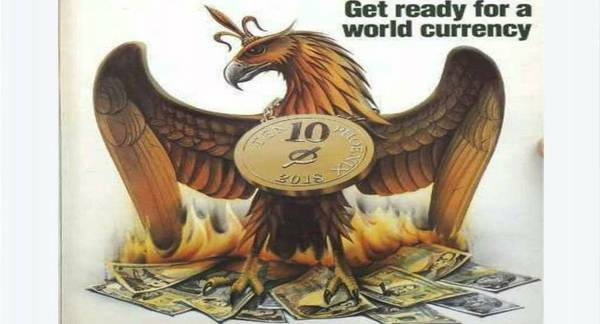 And remember, all the way back in 1988, globalist mouthpiece The Economist predicted a new global currency by 2018, represented on their front cover by a phoenix rising from the ashes of burning fiat money. We've also long believed that the globalists will carry out a 'scorched Earth' policy all across the planet before allowing themselves to be taken down. With all of these global events happening concurrently and the globalists having their hands in each, as Susan Duclos reported today on ANP, during days like these where it feels like the entire world has gone mad, we turn to Jesus and pray that we are safely delivered to the other side, with a return of sanity to our world that's deeply in need of it.